It’s the day before Thanksgiving which means we have a long day of travel ahead of us tomorrow! A busy holiday where we’ll be eating not one, but two Thanksgiving dinners, means I’m baking a light yet indulging breakfast today for us to enjoy with coffee before we rush out the door tomorrow! Breakfast casseroles are perfect for this sort of thing too, but we have to mindful of the amount of eating that will happen between the hours of 1:00 and 6:00 PM tomorrow. Don’t be fooled; just because we have two dinners does not mean we practice self discipline and eat a little at the first one and a little at the second. Exact opposite? You betcha. 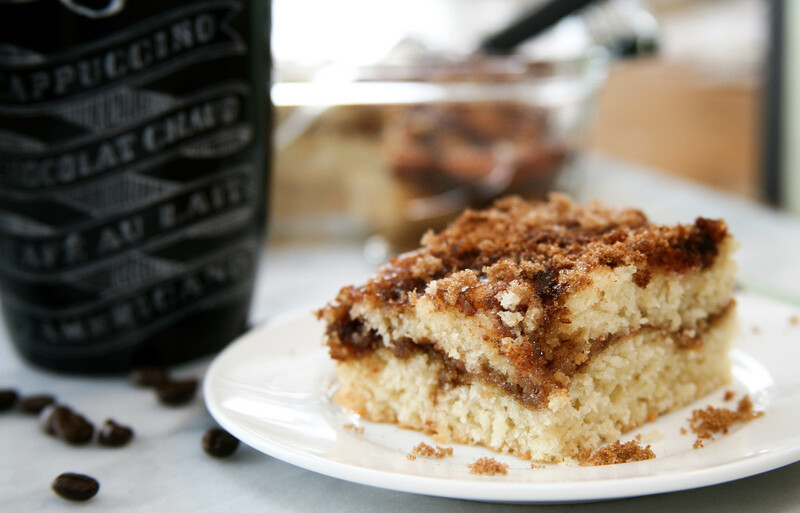 And I’m not blaming anyone, because it’s a delicious day I thoroughly enjoy.This coffee cake is really something I make especially for my husband who likely couldn’t go one day without coffee. He’s not much of a breakfast person so giving him something small that can be enhanced when dipped in coffee is the perfect morning treat for him! Also, holidays justify dessert for breakfast, don’t they? The phrase ’tis the season’ exists for a reason! At the same time, don’t expect to see too many of these recipes pop up around here. You know, once we get past the holidays. I do want to keep a healthy theme going here, but when I talk about spreading wellness in its fullest sense I tend to think that goes beyond fruits and vegetables. In this case, it’s about a lazy Thursday morning with some sweet food and conversation with my husband before the hustle and bustle begins. Some good old quality time to focus on the mind and the emotional part of the body. I really encourage everyone find the time for this around the holidays. Take a step back, relax and enjoy the moment doing nothing more than the basics. Have a happy and safe Thanksgiving, friends! In a large mixing bowl, combine oil, eggs, vanilla and milk. In a separate bowl, blend sugar, flour, baking powder and salt. Add the flour mixture to the egg mixture and stir well to combine. Pour half the batter into a 9×13 pan. In a third bowl, prepare streusel by mixing brown sugar and cinnamon. Sprinkle half the streusel over the batter in your baking pan. Top with remaining batter and sprinkle the remaining streusel on top. Bake uncovered at 350 for 25-30 minutes. Store in airtight container. This entry was posted in Breakfast, Recipe Book and tagged cake and coffee, coffee cake, easy coffee cake, make ahead breakfast. Bookmark the permalink.